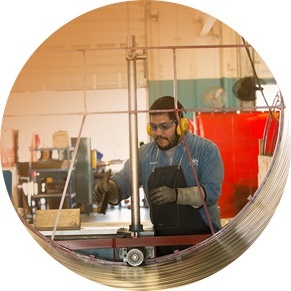 TDIndustries brings years of insight and innovation to manufacturing and industrial projects. From the construction of a Class 10,000 high-purity pharmaceutical to an eight-week renovation of a high-tech manufacturing facility, Partners will deliver an on-budget, on-time final product. We have decades of experience in building mechanical, plumbing and controls systems for facilities in semiconductor, biotechnology, pharmaceutical and manufacturing sectors. Aggressive timelines are typical for high-tech manufacturing or industrial construction projects. TDIndustries keeps collaboration, safety and the unique complexities of those facilities top of mind. Your manufacturing or industrial facility might require unique exhaust or ventilation fans, customized cooling technology or specialty piping. TD prides itself on delivering those systems, beginning with value engineering. Our in-house engineering group examines the constructability and our manufacturing group utilizes multi-trade prefabrication to execute the final installation. Read more about our Construction process. Our life-cycle capabilities extend the life of your capital assets through MEP truck-based service. From emergency outages to planned maintenance, we offer mechanical, electrical, plumbing, commercial refrigeration, energy management services and more. Give our Service group a call today: 1-800-864-7717. Discover what clients like INSYS Therapeutics and McCommas Bluff Landfill’s Biomethane Extraction Facility already know: TDIndustries knows high process facilities.